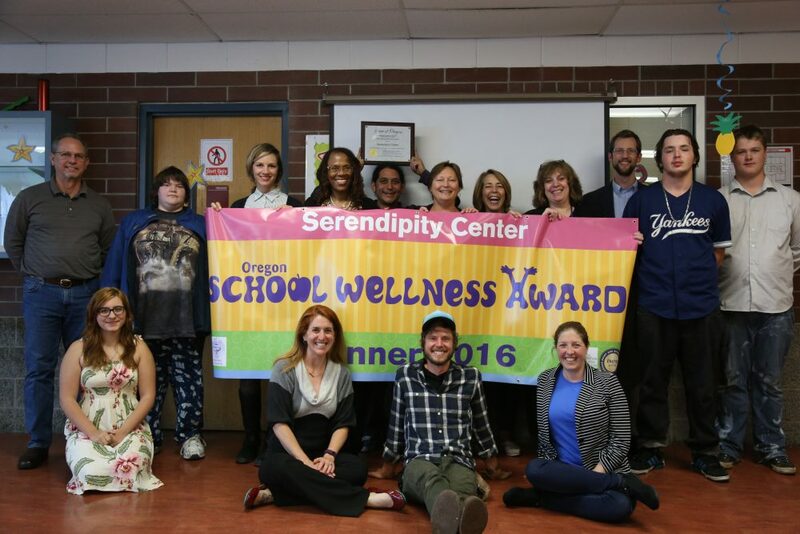 Serendipity Center is excited and proud to announce that we are the recipients of the Oregon School Wellness Award for 2016! As one of only 3 schools in the state of Oregon to receive this amazing accolade it is a testament to the strength and vision of our food services program led by Joey Ogo and Brian Thompsen, as well as the leadership of Nicolas Townsend and the growth of the Growing Minds Garden. Serendipity would like to thank the representatives of Oregon Department of Education, Oregon Dairy and Nutrition Council, and the Nutrition Council of Oregon for visiting our campus and presenting the award in June – Specifically: Amy Gilroy, Heidi Dupuis, Joyce Dougherty, Suzanne Hidde, Kristin Hall, and Crista Hawkins. We would also like to thank our ex officio and current board members, staff, students, and families for joining us in our special celebration. The presentation of the ODE School Wellness award coincided with another monumental achievement for our Growing Minds Garden program, the ribbon cutting and unveiling of our new greenhouse. The construction of our greenhouse was made possible by a generous grant from the Employees Community Fund of Boeing Pudget Sound. Thanks to their contribution we will be able to provide our students with valuable instructional time during the more challenging winter months, and also provide our garden with more capacity to grow delicious fruits and veggies!